Los Angeles, CA - Nov. 3, 2016 - /PRNewswire/ - LeVar Burton's RRKidz, Inc., the home of Reading Rainbow®, announced today it will donate Skybrary® Family subscriptions to Reading Is Fundamental (RIF), which provides free books and literacy resources to economically disadvantaged communities in the United States. For every Skybrary Family subscription that is purchased between now and the end of the year, a subscription will be donated. "We're honored to donate Skybrary Family subscriptions to RIF, an organization that has become close to my heart over the years due to our shared mission of inspiring children to read," said LeVar Burton. "I've always been passionate about engaging young readers and continue to work toward my vision of literacy for every child, everywhere which is why we developed Skybrary." Skybrary Family continues to grow and is now available on multiple platforms including mobile devices (iPhones), tablets (iPad, Kindle Fire, and Android) and via the web. 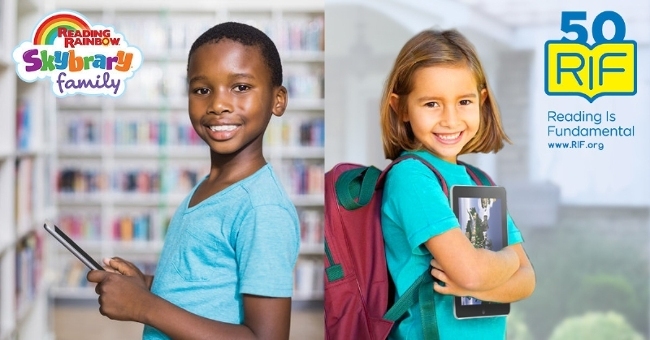 The Skybrary platform picks up where Reading Rainbow's mission left off, bringing comprehension and intellectual engagement into the Digital Age. In fact, the Skybrary user base consists of many parents that grew up watching Reading Rainbow and are excited to introduce Burton's storytelling to their kids via new platforms. By infusing digital books with purposeful interactivity, engaging narration, and pairing them with delightful videos hosted by Burton, Skybrary captures the magic of the original show while helping children find relevance and understand context in their reading. Skybrary Family offers more than 600 children's books from esteemed authors and publishers, making finding the right books to inspire young readers easier, and more fun, than ever. With new books added each week, kids read on their own, or along with narration. What's more, with over 250 newly produced and classic education Video Field Trips, Burton takes young explorers on adventures filled with fascinating people and places where they get to learn about the world around them. New videos include field trips to Wolf Connection, a unique education sanctuary and wilderness retreat for rescued wolves; The Academy of Music for the Blind, dedicated to addressing the unique talents and challenges of blind youth by helping them develop a variety of cognitive, physical and social skills through music and the performing arts; and a trip to Panama, which introduces kids to places and cultures they may not be familiar with. Skybrary Family continues to grow and is now available on multiple platforms including mobile devices (iPhones), tablets (iPad, Kindle Fire, and Android) and via the web for $4.99 per month or $39.99per year. Between now and the end of the year, for every Skybrary Family subscription that is purchased a subscription will be donated to RIF. For additional information on Skybrary Family and Reading Rainbow, please visit www.ReadingRainbow.com. And, to learn more about Reading Is Fundamental and its 50 year legacy of inspiring children to read, please visit www.rif.org. The multi-award-winning Reading Rainbow® children's launched in 1983 to encourage kids to read, by bringing books to the television screen. Over the next 26 years, actor/director LeVar Burton (also known for iconic TV roles as Kunta Kinte on "Roots" and Geordi La Forge on "Star Trek: The Next Generation) hosted all 155 episodes, inspired millions of people to love reading, and dedicated his life to promoting literacy and the love of learning in children everywhere. In 2012, RRKidz, Inc. reimagined the iconic brand for today's digital families and launched the enormously successful Reading Rainbow App. RRKidz, Inc. has since launched numerous enriching products to children and their parents, including LeVar's first children's book, The Rhino Who Swallowed a Storm. The mission of RRKidz, Inc. is to instill a passion for learning in "Every Child, Everywhere"- at home and in the classroom. Reading Rainbow® and its logo are registered trademarks of Western New York Public Broadcasting Association (WNED-Buffalo) and used with permission. ©2016 RRKidz, Inc.